Mrs Adams is Keeper of The Dress! First things first. Warmest thanks to everyone who read yesterday’s post and congratulations to Ashley, Ged and Helen, all of whom correctly guessed that KoTD stands for Keeper of The Dress. But they were pipped to the post by Amy who had worked out what it meant before I had even sat down at work. So congratulations to Amy. A sweet treat will be slipping through her letterbox soon! Now where were we? Oh, yes, outside Sassi Holford’s shop in South Kensington. If you are a recent bride or a bride-to-be you are probably well aware of Sassi Holford but if not, her name may not be so familar. So let me introduce you: Sassi Holford is a wedding dress designer of international catwalk acclaim whose simply stunning creations have been described as being more society than celebrity. Indeed, in 2008 Sassi Holford was commissioned to design and make the gown which Autumn Kelly wore at her marriage to Peter Phillips, the Queen’s grandson. Stylistically, Sassi Holford creations span a wide range: from glamourous, highly sophisticated figure-hugging gowns to romantically frothy confections of lace and satin. But beneath even the most apparently diaphanous and softly flowing dress you will find the Sassi Holford trademark: a finely and expertly cut corset designed to ensure that every bride carries herself with the grace and poise befitting such a beautifully crafted gown. Located in a double-fronted shop on a bustling road in South Kensington, the Sassi Holford shop is the epitome of restrained luxury. Eschewing glitz in favour of elegance, the atmosphere is one of calm refinement which provides a retail balm sufficient to smooth the jagged nerves of any Bride-to-Be in search of her dream dress. Not having even the merest hint of regal or aristocratic antecedents, I admit that I felt slightly overawed by it all, but the gracious welcome which we received soon put me at my ease and before I knew it I was behind the curtain again, like Mr Benn, trying on yet another gown. Fig 3. 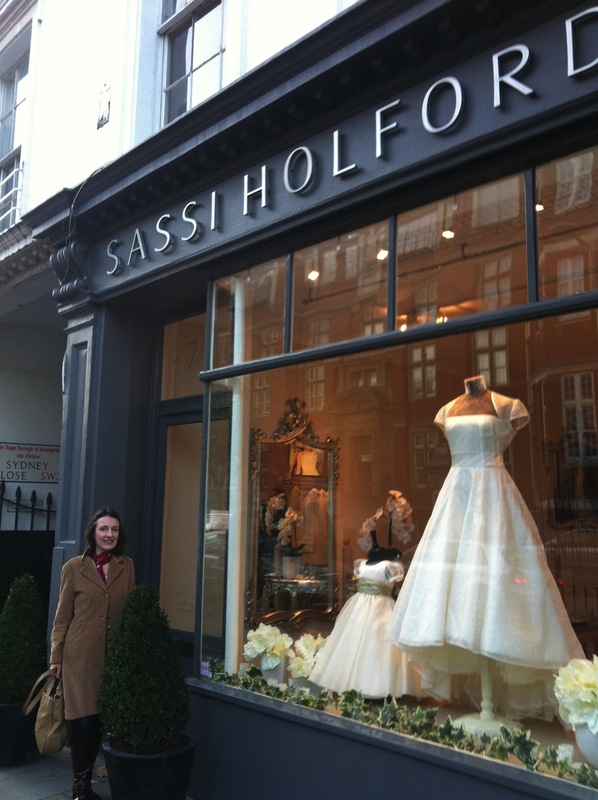 Mrs Moore-to-Be outside Sassi Holford in London. Did she succumb to temptation? The first Sassi Holford dress into which I was pinned elicited the same murmurs of approval from MoH and Mrs Adams as had all the other dresses I had tried on earlier that day at Blackburn Bridal. Their response to the second one was, however, somewhat different. When I stepped from behind the heavy drapes which separated me from them there was a moment of silence. And then a welling-up. And then excited exclamations that the dress was perfect and could have been designed especially for me. Even Eleanor, the bridal dress consultant, declared herself ‘moved’. And what of my reaction? Let’s just say that as I looked at my reflection in the mirror, I realised that the sense of just knowing when The Dress has been found isn’t a myth at all. It is as real as the tears that oozed, uncontrollably, out of my eyes. And yet, even amidst all the emotion, financial reality held tightly onto the reins of my impulse to place an order. For I knew, without even asking, that the cost of having the dress replicated to my measurements would be in excess of anything I could afford. But at that moment, fate smiled upon me and taught me that sometimes dreams really can – and do – come true. For Eleanor announced that the dress (which shall remain nameless) was a sample from the previous season and was being sold off at a fraction of the usual price. Of course, engaging the services of a seamstress to make the alterations necessary to scale the dress down to fit me will incur a not insignificant cost, but even taking that into account, it was, to use what I believe is referred to in modern-day parlance, a complete ‘no brainer’. So, before I knew it the three of us were in Harrods, sipping champagne and feasting on Laduree macaroons. It was, we all agreed, a most fitting way in which to celebrate the contents of the huge bag which was wedged between us. Fig 3. The photographic evidence would seem to suggest that all of Mrs Moore-to-Be's friends were right and she did indeed buy something that required a very big bag. Now several months on, it feels like a dream. More so since I don’t actually have the said gown in my possession. The seamstress that Sassi Holford recommended is based in Battersea, so rather than bring The Dress back to Birmingham, Mrs Adams very kindly agreed to accommodate The Dress at her flat in Blackheath until June when the whole alteration process is scheduled to begin. So Mrs Adams now has that most august of titles: Keeper of The Dress and will thus henceforth be known as Mrs Adams KoTD. 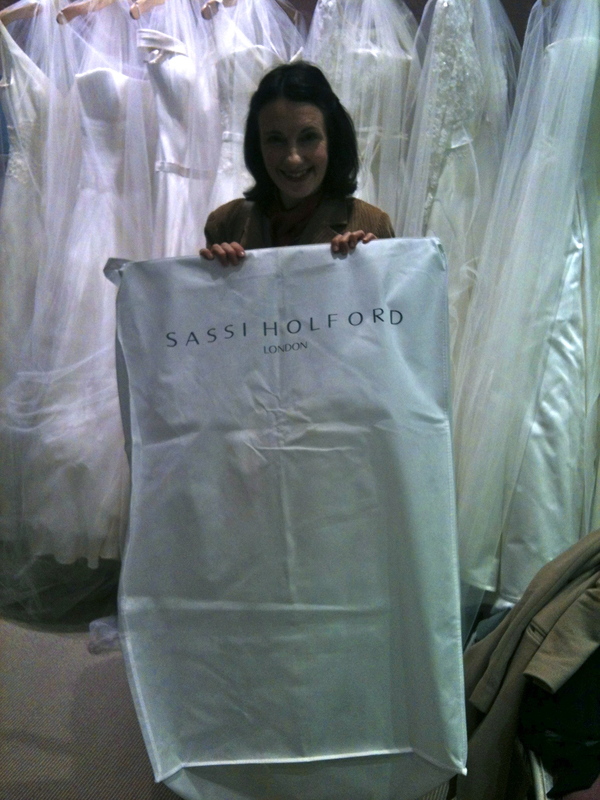 Of course, I’m simply bursting to describe The Dress to you and long to post a photograph of me trying it on in Sassi Holford. But I’m going to resist any such temptation because I don’t want to spoil the surprise. 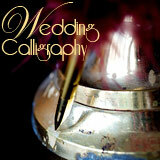 And indeed perhaps you’d rather not to know what it looks like in advance of the big day. Mrs Jarvis, who ranks amongst my oldest and most loyal of friends, has declined a pre-wedding peep, preferring instead what she describes as being a ‘Kate Middleton’ moment. So if you really want to know what it looks like, you’ll just have to come along to All Saints Church, Sherbourne on Saturday 6th October (or log on shortly thereafter to see the pics) when I will be taking The Dress for a walk up the aisle for all to see and, hopefully, for many to admire. Hankies at the ready! I just showed my fiance the first paragraph of this post and said ‘that’s me that is’! I’m so excited that you found THE dress. 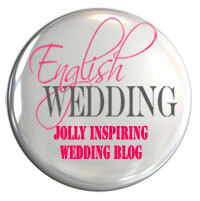 I also agree with Mrs Jarvis – a ‘Kate Middleton’ moment will be eagerly awaited. Hi Pamela! We literally just bounced across your blog whilst looking for some ‘Sassi-related’ details. What a find! The way you write is just brimming with such happiness, it’s pure pleasure to read. It’s part of our jobs to care about those fabulous brides-to-be out there, it puts a huge smile on our faces to see such a happy girl. Hooray to your KMM aka Kate Middleton Moment!